Today, for the first time in history, over half of the world's population lives in an urban environment, whether in cities, metropolises, or even supercities. The proportion of people with an urban lifestyle is increasing drastically around the globe and this situation is accompanied by hyper-urbanisation phenomena that expose the body to new forms of environmental aggressors. City air is polluted with fine particles, toxic gasses and ozone, which becomes harmful when it is found at ground level. The consequences on health are undeniable, especially for the most vulnerable. Pollution has also become a major issue at stake for the skin. The interface between the body and the external environment, the skin finds itself on the frontline facing new types of pollution. It experiences the full force of environmental aggressors, in addition to internal forms of pollutions ingested through breathing or diet. It is attached on two fronts, so much so that urban populations age faster than the rest of the world's population. There has never been such a strong realisation of the harmful role played by pollution. Accordingly, women instinctively identify them as ones of their skin's main aggressors, just behind stress and a lack of sleep. UV rays have long been considered as partly responsible for the formation of pigmentation marks. This is why for the past few years the Lancome laboratories have been striving to raise women's awareness of the need for an optimum protection routine. Offering the skin a "safe zone"
Lancome is incorporating this promise of a "safe zone" into a new skincare and makeup ritual dedicated to city dwellers who, day after day, want to say no to pollution-induced dark spots and signs of ageing. A ritual that promises to restore sought-after skin clarity and a fresh, rosy, dewy complexion-a sign of youthfulness. Blanc Expert Mousse Lotion, the no-rinse toner that hydrates and plumps up the skin (RM240) + Blanc Expert Spot Eraser, the iconic skincare that targets dark spots (RM420). Blanc Expert Cushion Light Coverage, protective second-skin light coverage (RM188). Black Expert Cushion High Coverage, protective second-skin high coverage (RM188). Dryness, premature wrinkles due to skin oxidation and uneven skin tone: Air pollution takes its tolls on healthy skin. The more polluted the air, the more easily hyperpigmentation marks develop on the skin. There is a strong correlation between the concentration of gas in the atmosphere and an increase in the formation of pigmentation marks. Women living in a polluted environment have 24% more dark spots than other women. Fine particles lead to a 22% increase in the number of dark spots on the forehea and a 20% increase on the cheeks. Pollution intensifies wrinkles, especialy the nasolabial fold, which becomes more deeply lined. Pollution increases skin dehydration by 12% and skin sensitivity by 39%. Pollution does not only have the downside of attacking skin directly, it also amplifies the harmful effects of UV rays, primarily UVA and long UVA rays, which are found in cities all year round. Sebum preoxidation, a signal of an acceleration in the signs of ageing, increases by 200% between exposure to UVA rays alone and exposure to UVA rays combined with pollution. The Lancome solution: a cocktail of antioxidant and anti-pollution active ingredients, which are found in the Blanc Expert-UV Expert formulas. Moringa: the leaves of this tree native to India, renowned for its "300 benefits", are extremely rich in vitamins, minerals and proteins. Known for its action on pollution and against the fine particles that adhere to and penetrate the skin, Moringa is found in UV Expert Aqual Gel and Blanc Expert Cushion. Vitamin E: it is vital for the body but is not produced by it in any ways. Vitamin E has many positive roles, including its important antioxidant action, traps the free radicals and has anti-ageing virtues. Vitamin E is present in UV Expert Aqua Gel. Every day, it is the instinctive step to protect your skin: arming it with a shield against environmental aggressors, with a formula as light as a rose petal. Lancome has incorporated filters and active ingredients at the heart of this aqueous gel that maintain a "safe zone" for all skin types. In addition, the texture delivers nutrition and hydration to every dermis, even sensitive, with an extremely lightweight action. The texture benefits from a polymer that breaks open on application, enveloping the skin in a wave of freshness. Unprecedented sensations for a protective product. Its assets: Effective protection against UV rays and air pollutants. Intense hydration. A beneficial aqueous texture. It protects against UVA and UVB rays and pollution. Sebum preoxidation decreases by 93%: it reduces oxidative damage caused by the duo of UV & pollution. The aim of this corrective range with visible results is to lastingly restore a fresh complexion and erase urban pollution-induced dark spots. This micro mousse lotion used after cleansing promises to create the right conditions to prepare the skin to benefit from subsequent skincare. It diffuses its depigmentating and soothing active ingredients over the skin. Salicylic acids acts on the surface to help to remove dead cells. These two actions provide a real initial visible benefit in terms of skin luminosity and freshness. Designed for all skin types, even sensitive, its formula is enriched with a gentian extract, a plant grown at altitude in France and used for centuries in the French pharmacopoeia to soothe the skin. Blanc Expert Spot Eraser offers a comprehensive strategy to actively combat hyperpigmentation. It contains rose and mint extracts for their soothing properties, and a duo of two benchmark active ingredients, vitamin CG and ellagic acid, to reduce melanin synthesis, all completed by a combination of yeast and red algae to promote the breakdown of this pigmentation in the keratinocytes. The surprising texture initially gives the illusion of a certain generous consistency under the fingertips, and then as soon as it is applied to the skin, it becomes fresh, aqueos and totally evanescent. Its assets: An intense corrective treatment against dark spots induced by the different types of pollution. An ultra-light aquous texture. It suits all skin types, even sensitive. Skin tone is more even for 98% of women. Dark spots appear reduced for 94%. Skin is fairer for 100%. The formula is tailored to their skin for 94%. Since the launch of its first cushion in 2015, Lancome has ceaselessly put the best of its skin care and makeup expertise to the service of this technology. The cushion now comes in two types of coverage. Already renowned for its lightness, long-lasting hydration and second-skin effect, Blanc Expert Cushion Light Coverage continues to improve the seonsory feel of skincare with an airy texture and an antioxidant formula. Once applied, skin is beautifully enhanced, as if it had a rosy, windswept glow; it breathes and looks luminous. The secret of this reinvented lightness? Aeragel. Compsed of air at 90%, this particle is twice as light and luminous as a conventional particle.These exceptional properties make Aeragel a major active ingredient in Blanc Cushion Expert, all the more so as its porous nature allows it to absorb up to four times its weight in sebum, offering the promise of infallible hold. The secret for the cushion High Coverage its the PolarTM technology developed for Lancome. The cushion consists of fibres identical to those in fleece clothing, finely intertwined to hold a formula that provides more coverage than a traditional cushion, while delivering just the right amount of product on application. Today, it is pushing back the boundaries of skincare with a formula that protects against certain effects of pollution. It contains four new ingredients renowned for their antioxidant properties, particularly Moringa extract and Baicalin, which shields againts oxidative stress. 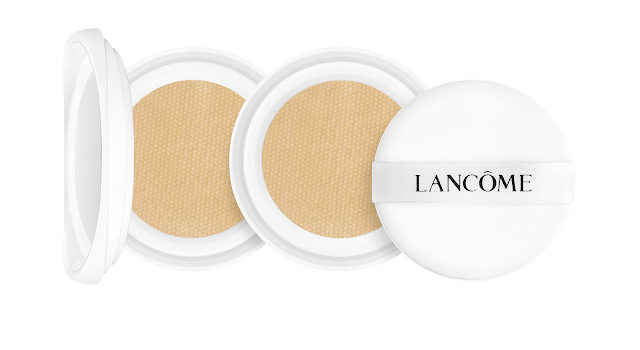 Once applied, Blanc Expert Cushion Light and High Coverage beautifully enhances the skin. It seems to have a rosy, windswept glow; it breathes and looks luminous. Skin tone is even and the skin protected for hours. 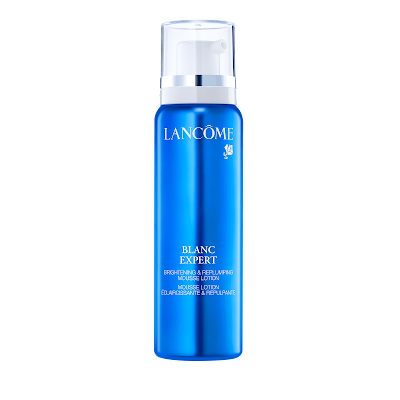 Blanc Expert also comes in a Fluid version to satisfy every texture wish, still with the same lightness and the same fresh and radiant result.